During the Soviet era, there were only a few types of ice cream available, and their names and prices were familiar to all. 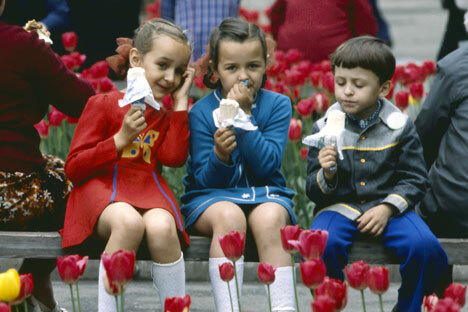 The Soviet state had national standards for ice cream, known by the acronym GOST – from the Russian for State Standard (Gosudarstvenny Standart). Introduced in 1941, these standards were considered some of the strictest in the world and are responsible for the unique taste of Soviet ice cream. According to the standards, the ice cream could include only natural ingredients and could contain no chemicals of any kind. The GOST acronym represents a flavor as well, and this flavor was that of the most basic Soviet ice cream, the plombir. The plombir weighed half a pound and cost 48 kopecks, which was expensive for the time. The producers of this ice cream considered this portion enough for dessert for an entire family. However, many people considered this portion enough for just one person – especially if covered in homemade jam or grated chocolate. Another popular ice cream had a chocolate shell. It was known as the eskimo and was advertised with the image of a penguin. The eskimo was available with a basic chocolate shell or a flavored one. One of the best-known varieties was the chestnut-flavored kashtan. In the ads for the kashtan, the ice cream was removed from its wrapper and placed among chestnut leaves, which looked very similar to Canadian maple leaves. The kashtan was not always available, and whenever it appeared in the shops, a line appeared immediately. The Lakomka appeared in the mid-1970s and almost immediately became one of the most popular ice cream varieties for children. This type of ice cream, a tube-shape containing ice cream with 12 percent cream was produced on a Western-manufactured line that had no analog in the Soviet Union. The glaze was not applied on the production line but by dipping. The base of a Lakomka could be white or chocolate ice cream, but the applied glaze was only of milk chocolate. The ice cream “shelkunchik” (nutcracker) was a Lakomka whose chocolate glaze was generously covered in crushed nuts. Fruit-flavored ice creams were the least popular, but they were the cheapest – they cost only seven kopeks. Today this fruit sherbet could capitalize on its low-calorie count, but no one in the Soviet Union worried about counting calories. In fact, the prevailing trend was the more calories, the better! One of the more popular fruit ice creams was the yellow pineapple-flavored type. It was not as tasty as the plombir or vanilla flavor, but its exotic color made it attractive. The most exciting variety of Soviet ice cream was the two-in-one, which was basically ice cream in a cone. The basic vanilla ice cream in a cake cone decorated with a little roses cost 19 kopeks. It can still be found in stores today. The most legendary Soviet ice cream was that from GUM (Main Department Store) in the center of Moscow. It came in crème brûlée, chocolate or vanilla flavors and was served in a waffle cone. Many tourists to Moscow made the ice cream counter at GUM their first stop in the capital. After all, it was convenient to Red Square, the Kremlin, Lenin’s Mausoleum, and St. Basil’s Cathedral.